Now you are about to find that we are closer than you thought....we'll be looking for you. Our actual address is 29080 Hawk Drive, Farmington, Iowa 52626. I know, you don't have a clue where Farmington, IA is so I will try to help you out. We are in the Southeast corner of Iowa which puts us right in the heart of the Midwest and within driving distance of many major cities. Take a look at the distances below and you will no doubt get a rough idea of how far away you are located. We have excellent access on a hard surfaced road so don't worry about the weather. Below are three maps which shows our general and specific location within the state and within Van Buren County. 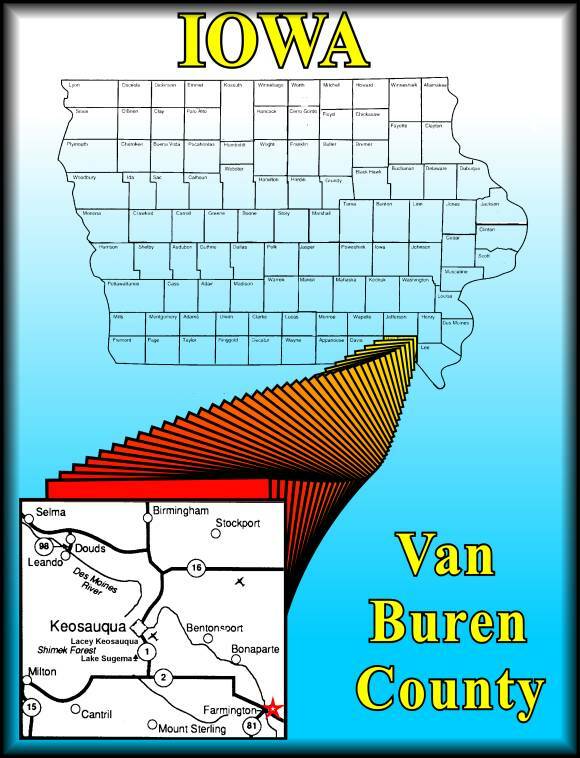 Once you get to Van Buren County you should not have a problem finding Farmington, IA. Now that you are in Farmington just go south on S. Front St. which turns into Hawk Dr. for about a mile and one half from the center of Farmington and you will be at the River Valley Lodge and Campground. In case you are coming in from the east on Highway #2, turn left at the Greenglade Cemetery on 285th Street (known to the locals as "Sandy Lane") when you first enter Farmington and continue on to the Des Moines River where you will turn left on Hawk Drive. Just follow Hawk Drive for approximately one half mile and you will be at the campground. The second map below shows part of Iowa, Missouri, and Illinois and the related highways which should give you a good idea of how to find Farmington, IA if all else fails. 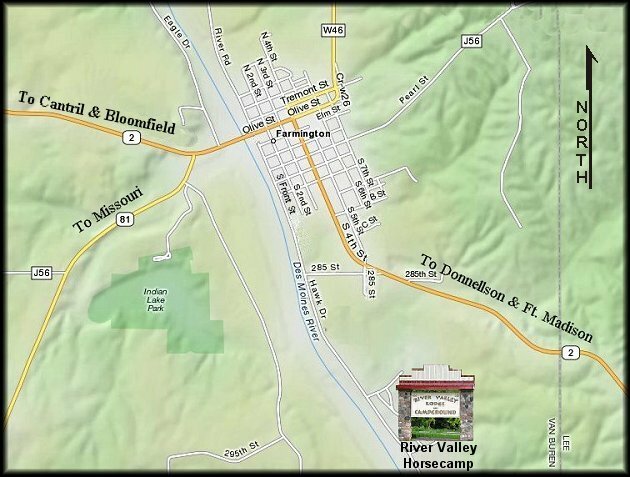 Finally, the third map shows Farmington, River Valley Horsecamp, and the related roads and highways. If for some unknown reason you still find yourself lost just give us a call at 319.878.3888 and we will give you directions or send out the posse. Note: if you are coming from the east on Highway #2 and you have printed out the driving instructions from MapQuest.com please be aware of the following. MapQuest will tell you to turn left onto S 5th Street which is incorrect as you cannot turn left on S 5th Street. The first thing that you will notice if that you can only turn right on S 5th Street. Do NOT do it! You should turn left on 285th Street which is directly across from S 5th Street. Whether MapQuest is incorrect or the City of Farmington has the street named incorrectly, I don't know. What I do know is that you should turn left on 285th Street! We have had several individuals lost buy turning right on S 5th Street so again, don't do it. In short, go west off Highway #2 towards the river. Another Note: if you are coming from the west on Highway #2 you should turn right (south) immediately after you cross the Des Moines River bridge. This will be Front Street which will turn into Hawk Drive. After you turn right at the end of the bridge just follow the river downstream (south) for approximately one and one half miles and you will will find the campground on your left and the river will be on your right. If by chance you have printed out directions from Yahoo Maps disregard your printout because Yahoo does not think that we exist and will attempt to take you out into "no mans" land.